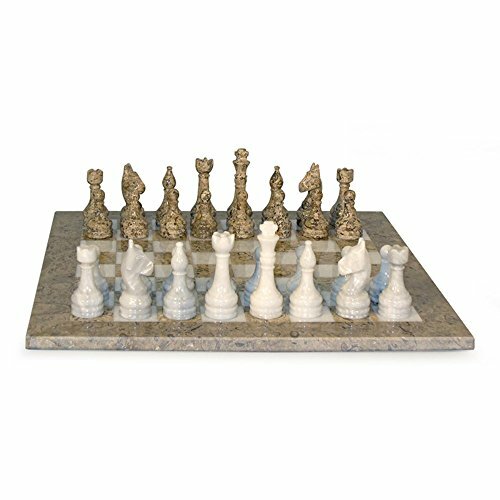 The World Wise Imports Coral and White Marble and Onyx Chess Set has a twist on a classic design, providing both board and pieces for decorative or playing purposes. A full set of chessmen are included: one side is made from white marble and the other from coral-color marble. The chessmen are designed in the classic Staunton style. The board is made from thick marble with matching coral and white squares. Everything is polished to a glossy sheen. About WorldWise Imports Specializing in retail and online merchants, Worldwise Import founder Cheryl Stern has assembled a team that has the experience necessary to import the very best international products. Since 2001, the team has traveled all five continents to find and supply the finest in chess, backgammon, cribbage, and other traditional games, as well as some exotic and not so traditional games. Worldwise Imports' commitment to excellence has helped it become a leader in world import markets. Dimensions: 16L x 16W x .5H in.. Square size: 1.6 in.. Carved entirely from marble. King height: 3.5 in.. Piece base width: 1.25 in.. Manufacturer's limited 1-year warranty.